Summon your smallshell minion. The mere sight of this wee wavekin may cause severe psychological trauma to those who spent years of their lives on faraway shores culling his relatives. As is implied by its name, the smallshell's shell is small. 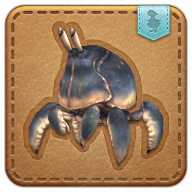 What is not widely known is that unlike normal crabs whose shells grow thicker and, hence, larger as the crabs age, smallshell carapaces actually reduce in size due to erosion over the wavekin's lifespan, until nothing is left but legs.